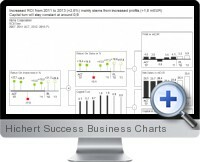 Excel Hichert Success Business Charts (Chart-me) enable data visualization and creation of high standard business graphics for efficient communication. The Excel add-in allows design reporting layouts, add visualization modules and link with Excel or external data to produce high quality graphics under the Hichert Success approach certified by IBCS (International Business Communication Standards). Fast development time with intuitive interface and help content. Clear and concise communication by industry leading edge data visualization techniques. Fully integrated within Excel and linking the data sources. Business charts can be published used without the add-in installed. More than 80 charts and data visualization modules to choose from. Combine modules for interactive storytelling and correlation analysis. High resolution graphics are suitable for video, print and presentation media. Publish reporting graphics to the web with SharePoint and Office 365. Choose from predefined layout and customize for specific communication purposes. Apply styles to individual components or uniformly to all charts within a report. Business data visualizations include variations of column, bar, line, needle, dot, waterfall, surface, bubble and bubble pie charts. Includes graphic scaling and compression tools. Compatible with Excel 2007 and higher.